The Journal of the International Association of Sound and Audiovisual Archives represents the collected research and applied work of the global audiovisual archives community. 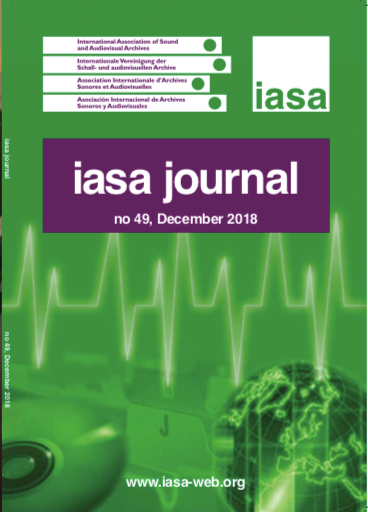 Also known as the IASA Journal, it is published in issues bi-annually and available to all members of the IASA community. The IASA Journal uses a double-blind peer-review methodology (the authors do not know who reviews their papers, and reviewers do not know who wrote the papers they are reviewing). Issue 49 of the International Association of Sound and Audiovisual Archives (IASA) Journal. Currently includes 3 articles, 2 profiles, 1 announcement, 1 obituary, 1 editorial, and 1 president's letter. Print version includes five advertisements: NOA, Memnon, AVP, SAA, and JTS. Physical copies will be shipped to subscribers and members when the issue is complete.